Dorothy A. “Dottie” Meehan – (86) – formerly of 188 East Ave., Hornell, died Friday evening (July 27, 2018) at Elderwood at Hornell, where she had resided for the past four years. Born in Rexville, NY on September 30, 1931, she was the daughter of John & Blanche (Waterman) Meehan. Dorothy lived her early life in Rexville where she attended school in a 1 room school house until 6th grade. She spent her teenage years in Hornell and was a graduate of Hornell High School (class of 1948). She later graduated from Hornell Business School. Dottie was employed for over 35 years at New York State Electric & Gas (NYSEG) beginning as a customer service clerk and later as secretary to the District Manager. She retired in 1988. For 45 years, Dottie was associated with the Hornell Children’s Home where she served as bookkeeper, secretary and was a member of the board of directors. 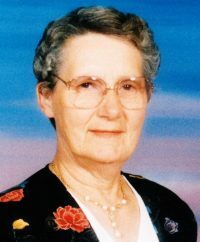 She was a member of Our Lady of the Valley Parish and a communicant of St. Ann’s Church. She was an avid reader and also enjoyed bird watching. Dottie loved to travel and especially enjoyed the 28 day motor trip through Italy that she took with her best friend, Josephine “Jo” Carretto. She also enjoyed rooting for the NY Yankees and Buffalo Bills. In addition to her parents, Dorothy was preceded in death by her brothers, Francis Meehan & Gerald Meehan; her sister, Evelyn Voorhees; her nephew, Thomas Meehan; her niece, Susan Stillman. Surviving are her best friend of 70 years, Josephine “Jo” Carretto; several nieces, nephews, great-nieces & great-nephews. At Dorothy’s request there will be no calling hours. A Mass of Christian Burial will be celebrated on Wednesday at 10:00 AM at St. Ann’s Church with burial in St. Mary’s Cemetery. Dottie’s family request that memorial contributions in her name be made to St. Ann’s Academy, PO Box 446, Hornell, NY 14843. Aunt Dottie was the best aunt in the entire world for 7 little children growing up in Rexville on the farm. Loved her to the moon and back. So sorry you are now at peace. Please say “hello” to dad, Ron and Theresa from us! Will be missing you Aunt Dottie! I didn’t know Dottie, but I’ve known Marlene for years. If Marlene is a product of Aunt Dottie’s inspiration, then she must have been an amazing woman. I am so sorry for your loss Marlene, Barb, and all of the rest of Dottie’s family and friends. Dottie will forever be in our thoughts and prayers. She was admired by many and did so much for the people in her life. I will always remember those hot pancakes on Sundays after church. Janet and I will miss her and may God Bless her always. She will always be in our prayers. Dottie was family and it will always be Aunt Dottie and Aunt Jo.